Pale olive or brassy brown in color with indistinct black blotches that form vertical barrings (the blotch above the pectoral fin is darker). Wavy blue lines on the head and the lips are purplish-blue. The caudal fin is tri-lobed on adults. Edge of the nape is unscaled. Bank Sea Bass are found offshore in deep water within rocks and reefs. 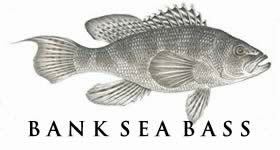 Bank Sea Bass start life as females and then change to male after three to four spawning seasons.